I wonder if the Farrelly Brothers knew they were creating a potentially epic storyline when they invented Harry and Lloyd. There are comedy characters that are good enough for one movie, and then there are character duos like Harry and Lloyd, both of whom may be having adventures well in to their sixties. Harry and Lloyd are perpetually moronic best friends oblivious to how utterly dumb they are. And while a film titled “Dumb and Dumber” might feel like a forced insistence on comedy, the Farrelly Brothers road comedy manages to be one of the funniest films of all time. Jim Carry at his prime plays Lloyd while Jeff Daniels is Harry, two idiotic best friends that spend their days trying to make ends meet, unaware of the havoc they’re causing. Harry is a dog groomer who wiles away the day riding around in a truck he spent his entire life savings customizing to look like a dog’s head, while Harry is a limousine driver. One day Lloyd realizes a client named Mary has left behind her brief case and decides he wants to return it to her. He’s decided he’s had enough of his monotonous life and travels to Aspen to return it to her along with Harry in their dog truck. Little do they know they’ve stumbled on to a kidnapping plot involving Mary, her husband, and rich extortionists. The group of extortionists attempt to knock off Harry and Lloyd, but oddly enough their stupidity keeps getting them out of trouble. 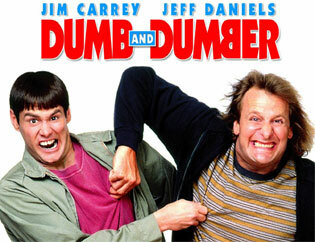 “Dumb and Dumber” relies more on subtlety to get its rapid fire comedy across. And while it does hit the humor on the nose on occasion, even then it manages to be absolutely hysterical. Lloyd’s awe at a thirty year old newspaper clipping about man landing on the moon is surprisingly hilarious, as well as the playful date between Harry and Mary that ends in an actual fist fight. While Daniels and Carrey are prone to physical comedy and gross out gags for most of the film, they’re also given some hysterical one-liners and word play that they deliver with ace timing. Carrey is at his best here as Lloyd, a man prone to bouts of outrageous physical feats and delusions of grandeur, as Daniels offsets Carrey’s comedy with a more downplayed idiocy. The two characters are so entrenched in their own world and faculties they’re always unaware that they’re driving the people around them nuts. You have to love the grooming montage when Lloyd pretends to have his throat cut by his barber resulting in the poor man fainting. And the fact that they manage to be so infuriating they even drive a skilled hit man nuts is nothing short of brilliant. You would never think Jeff Daniels and Jim Carrey would make a perfect comedy duo but lo and behold, “Dumb and Dumber” is easily one of the funniest (and most quotable) movies ever made with infinite replay value. This entry was posted in Movie Reviews and tagged Adventure, Comedy, Crime, D, Romance. Bookmark the permalink.